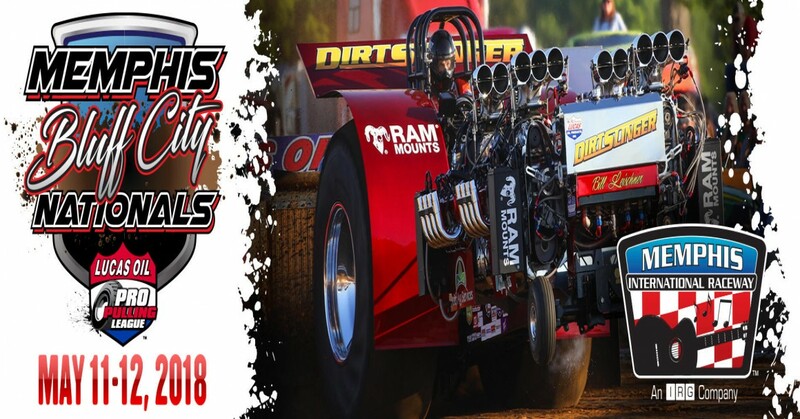 The event is sure to excite: Memphis Bluff City Nationals presented by Dart's Carts - Super Modified Tractors; Super Modified 2WD Trucks and Mini Rod Tractors May 11-12, 2018 Gate times each night 5 p.m. Action gets under way at 7 p.m. $35.00 - 2-Day $20.00 - Friday $25.00 - Saturday 10 & under FREE the entire event! The premiere pulling series in the United States, Lucas Oil Pro Pulling League, tours the country showcasing the most extreme vehicles and the most talented pulling drivers in the world. Featuring eight different vehicle classes from four engine, 5000+ horsepower tractors, to flame throwing jet turbine powered semi-trucks, it is a uniquely American competition that highlights the combination of sheer horsepower and driver skill. Memphis Bluff City Nationals will feature three classes: Super Modified Tractors, Super Modified 2WD Trucks, and Mini Rod Tractors. The Super Modified 2WD Trucks are filled with colorful American-made truck body styles, equally dazzling paint schemes and some of the more popular personalities behind the wheel. Using supercharged and alcohol-injected drag racing-type engines, these Trucks shock the crowd with their power and on-track antics. The weight transfer characteristics of these Trucks results in thrilling, towering wheel-stands at various points along the track to the delight of fans!